Ruler Quilting is Now Here! Once you have upgraded the software on your Janome MC9400, you’ll notice that there is a new addition to your display screen: RW or Ruler Work. By choosing one of the options under this menu, the Janome MC9400 will automatically ensure that there isn’t any problems using the automatic presser foot lifter and the QR foot. No need to worry about breaking a needle, damaging the presser foot or the Janome MC9400 itself. I had the opportunity to try out this new foot on my Janome MC 9400 and I love it! The QR foot is integral with its own foot holder, much like the Janome HP foot, which makes it super quick to attach to the machine. Ruler feet are always thicker than your other presser feet and visibility can sometimes be an issue because of this. This isn’t a problem with the QR foot though as Janome has carefully thought out the design of this foot: it has a U-shaped cut out at the front of the foot which means you can see what you are stitching, which is so very helpful. When using the QR foot, you’ll need to use quilting rulers, like those that long-arm quilters have been using for years. These rulers are thicker than the acrylic rulers that you use when cutting with your rotary cutter. DO NOT USE CUTTING RULERS WITH THE QR FOOT. Okay, sorry for shouting, but this is a very important point. You must use rulers that are at least ¼” thick when doing ruler work to avoid having the ruler slide under the foot and damaging the needle and possibly your machine. If you are new to ruler work, I would suggest getting a straight edge ruler to start to see if you like to do this technique (not everyone is enamoured with ruler work). There are lots of quilting rulers available, so be sure that you want to add this technique to your quilting arsenal before you spend lots of $$$ on rulers that you may never use. I am working with two Handi Quilter rulers (the Handi Quilter VersaTool and the Handi Quilter Ditch Ruler) in the video as I use these on my Handi Quilter Infinity and they are good ones to start with if you are a beginner. If you decide that ruler work is for you, you’ll have lots of fun choosing rulers to use when ruler quilting on the Janome MC9400. Click on the image below to watch a video about attaching and using the QR ruler foot on the Janome MC9400. Have you tried the QR ruler foot yet? Let me know your thoughts in the Comments below. UPDATE: The Accessory Upgrade Kit for the Janome MC9400 has just been released and it includes 2 new feet to use when free motion quilting. For more information about the Accessory Upgrade Kit, click here. The Janome Horizon Memory Craft 9400 QCP makes it so easy to free motion quilt! With its large harp space, ability to set the speed of the machine with the adjustable speed control, and the several free motion quilting feet included in the machine, you'll truly enjoy quilting your projects with it. To achieve the best result when free motion quilting, I have a few items I always use: the Supreme Slider, which allows the quilt to slide under the needle and Machingers quilting gloves which help me to grip the quilt and move it easily. To prepare the Janome 9400, I drop the feed dogs and turn the stitch length to zero. The most important and helpful thing I can do on the Janome 9400 is to adjust the speed control so the speed of the machine (how fast the needle goes up and down) is comfortable for me. I should be able to press the foot pedal all the way down and hold it there and the machine is stitching at a comfortable pace for me. This can vary for each quilter, so set it for what is right for you. Being able to adjust the speed control means that you don't have to think about the foot pedal at all: you just press it all the way to the floor and hold it there. 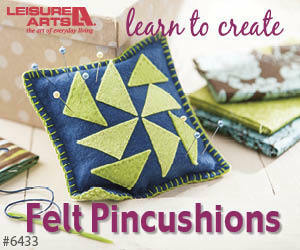 One less thing to think about when free motion quilting! It's important to use the right needle for the task and in this case, I use a purple tip Janome needle. I always use a new needle for each project which helps to give me good results. I also use the blue dot bobbin case which has less tension and works really well when free motion quilting. To find out more about Janome bobbin cases, watch this video. There are four different free motion quilting feet included with the Janome 9400: The PD-H foot, the QO (open toe foot), QC (closed toe foot), and QV foot (echo quilting). The PD-H foot is typically called the free motion or darning foot and this, unlike the other feet, has an integral foot holder. Be sure that the bar on this foot goes on top of the needle bar, which will allow it to "hop" as it quilts along. The other three feet will fit on your regular presser foot holder. They attach a little differently than other presser feet, so watch the video to see exactly how to attach them so they lock in tightly. The variety of presser feet that you can use is helpful and the Sewing Application on the Janome 9400 simplifies the choice of stitches: it does the thinking for you. You will have a choice of straight or zigzag stitches and this will depend on what needle plate you have installed on the Janome 9400. Once you choose a stitch, the Janome 9400 suggests which presser foot would give the best results when using this stitch. If you choose straight stitch 2 or zigzag stitch 2, you have the ability to change the height of the presser foot to the best height for the quilt thickness. I like a sewing machine that guides me to the choices that will give me the best results! To see how to set up the Janome Horizon Memory Craft 9400 QCP for free motion quilting, click on the image below to watch it on my YouTube channel. If you are hesitant to try free motion quilting on your Janome 9400, don't be! The features on the Janome Horizon Memory Craft 9400 QCP will help you in your free motion quilting journey and make this part of your project easy and enjoyable. You’ve been waiting for it and it’s finally here! The Janome Horizon Memory Craft 9400 QCP Accessory Upgrade Kit. What is it and how to I upgrade my machine? Let me tell you! The Accessory Upgrade Kit contains a USB that will allow you to upgrade the software in your Janome 9400 to allow you to use the four new feet that are included in the kit. 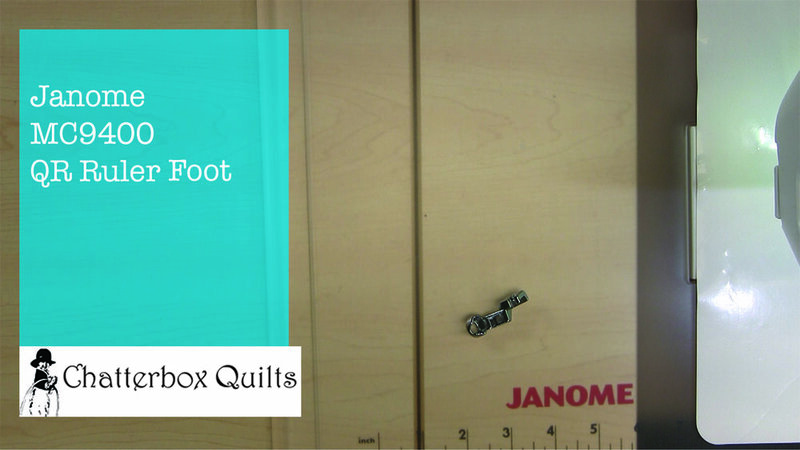 I’m especially excited about one of these feet in particular: the QR foot, which will allow you to use rulers when quilting on your Janome 9400. Now while you probably want to just start attaching and playing around with those new feet, you need to stop, hide them out of sight, and upgrade the software on your Janome 9400 first. You will have received a manual with the Accessory Upgrade Kit and the instructions for updating the machine software are on page 5, so turn to that page to start. You’ll also need the USB stick that came in the Accessory Upgrade Kit. Before you upgrade your Janome 9400, you want to be sure that it needs upgrading! You will need to upgrade it if the software version in your Janome 9400 is 2.0 or a lower number. If it is a higher version (number) than this, you won’t need to install this upgrade. How can you tell what version of the Janome 9400 you have? It’s easy! Turn on the Janome 9400 and watch in the bottom right-hand corner of the display screen. You will see “Ver.” and a number. My Janome 9400’s version was 1.0, so I knew that I was okay to upgrade it using the USB stick that came in the Accessory Upgrade Kit. This information is only shown for a few seconds, so keep your eyes on the bottom right-hand corner of the display so you’ll see it when you turn on the machine. Assuming that you need to upgrade to version 2.1, turn off your Janome 9400 and get your USB stick. Remove the cap and insert it into the port on the right side of the machine. Press it in firmly so it is secure. Now comes the magic part! Press and hold both the Needle Up/Down and the Lockstitch buttons as you turn on the Janome 9400. Hold both of these buttons until the display screen turns to yellow. This should happen quite quickly, so you won’t have cramped fingers! As the software installs, there will be a colour bar that comes down the display screen, starting with medium blue and then changing briefly to red and then to aqua – it’s almost like playing with the colour wheel! Finally, the screen will return to a solid medium blue colour and will say “FINISH” on it (see the image on the manual page above). This means that the software install was successful. Turn off your Janome 9400, pull the USB stick out of the machine and put the cap back on it. Now when you turn on your Janome 9400, you should see that it has been updated to “Ver. 2.1”. That was easy, wasn’t it?! One more quick thing to do. Get out your original instruction manual that came with your Janome 9400 and turn to page 97 for instructions on how to reset everything to the default state. Press on the Set button (wrench icon) on the display screen and scroll through the options, using the arrows at the bottom of the screen until you come to “Reset All to Defaults” and press “Yes”. You can then choose “OK” to return to the Home screen. To follow along with me as I upgrade my Janome 9400, click on the image below. I'll have more information about using the four new feet with the Janome 9400, so be sure that you are subscribed to my blog or my YouTube channel to be notified when these are posted. Do you have your Accessory Upgrade Kit yet? Let me know in the Comments below. There are many accessories available for sewing machines but it can be quite confusing to determine if an accessory will fit on your specific sewing machine. I use a Janome Horizon Memory Craft 9400 QCP and while it comes with a large assortment of presser feet and accessories, there are many more available for it. How do you determine if an accessory will fit this machine? First, you need to determine if your sewing machine is a high shank or low shank machine as most machines are one or the other. You can usually find this information in your sewing machine manual. The Janome 9400 is a high shank machine, so I won’t be looking at low shank accessories. This will eliminate some presser feet right away. Next I would be checking to see if the foot fits a 9mm machine or one that is a different size. This refers to the maximum width of stitch that a sewing machine can stitch. Again, the Janome 9400 is a 9mm machine, so I’m looking for attachments that will fit this machine. If I choose a presser foot that is for a 5mm machine and have my decorative stitch set for 9mm wide, well, it just won’t be a good combination and I suspect that there will be an unpleasant sound associated when I try to stitch with it. Not good! Your next resource is the packaging on a presser foot or accessory as it will usually give you some indication of which sewing machine the accessory will fit. Keep in mind that the packaging may not include recently issue sewing machine models, but your sewing machine retailer should be able to help you with this. It’s always a good idea to keep the packaging as it may include information on how to use the attachment – information you will definitely need when you go to use it! The first time that you are using a new presser foot or accessory, use your hand wheel to be sure that the needle doesn’t hit the foot when you start to use it. You may be able to adjust your needle position if there is an issue. Click on the image below to watch a video on my YouTube channel that provides more information on choosing the right accessory for your sewing machine. There are so many helpful features on the Janome Horizon Memory Craft 9400 QCP, that it is hard to just pick a few of them, but I'm going to try. 1. High Light - I'm sure you know that as you get older you need more light to see. Did you know that "people in their 60s need three times more ambient light for comfortable reading than those in their 20s"? * I know, it's shocking and I'm noticing this need for more light already. Thankfully, the Janome 9400 has the High Light which you can pull out and adjust to focus that light exactly where you need it. This bright LED light has helped me immensely with my quilting (especially since I've become a one-eyed quilter). I especially love that I can angle the light so I can place it just where I need it. A huge help for aging - or any - eyes! Can you find the High Light? It's behind the Janome name! Just pull out and angle it for the best light on your project. 2. HP Needle Plate and Foot – I’m a quilter and I can’t overemphasize how helpful this new needle plate and foot is for obtaining an accurate ¼” seam. It makes piecing effortless and accurate. I use this combination exclusively for my piecing now. 3. One Step Needle Plate Conversion – If you have ever struggled with a screwdriver to remove the needle plate on your sewing machine, you are going to love this feature! No worried about stripping screws or gouging your needle plate – just push down on the lever at the front of the machine bed and your needle plate pops off. You can then replace it with the one you need to use (you have a choice of three of them!). This is such a time saver and it’s actually fun to pop off and push on the needle plates on this machine. up pops the needle plate. 4. Automatic Thread Cutter – I use this feature all of the time, especially when I’m piecing a quilt. It snips the thread so I don’t have to stop to grab scissors to do this. I can just start sewing afterwards and don’t have to worry about tangled threads on the back of my project. Such a timesaver! Click on the scissors icon and the thread cutter automatically snips your top and bottom threads. 5. Superior Needle Threader – This is another feature that I really appreciate so I don’t have to struggle to thread my machine needle. With the new Superior Needle Threader, I just “lock” the machine, press down the needle threader lever on the side of the Janome 9400 and my needle is automatically threaded for me – every time. and your needle is automatically threaded for you every time! 6. Adjustable Speed Control – This feature is one of the big reasons I wanted this machine: I can adjust the top stitching speed. By sliding the Speed Control Lever, I can set the fastest speed at which the machine will stitch. This is extremely helpful when I’m free motion quilting: I can set the top stitching speed and press the pedal to the metal, knowing that the machine will only stitch as quickly as want it to. It takes this one element out of free motion quilting allowing me to focus on the design I am creating. Don't think that just because I've only mentioned 5 favourite features of the Janome 9400 that there aren't many more helpful features on it for simplifying and accuratizing (is that a real word?) your stitching. Whether you are a garment sewist or a quilter like me you'll appreciate the carefully chosen features that are included on the Janome Horizon Memory Craft 9400 QCP.